The final chapter in the Hawky New Year! series ends with red-tailed and Cooper's hawks in a snowstorm. On blizzard days I head out with my walker (verticality assistance device) and feed the birds and look for hawks. Two red-tailed hawks were flying around the feeder area, and a Cooper's hawk was hanging out in the snow over the Oven. Part 10 shows hawks on Jan. 30, which was a very sunny day, and Jan 31, the day of the storm. Part 10 of the Hawky New Year! video series is the final video in that series, although the Chasing the Hawks in Central Park series will continue, including the hawks I've seen so far in February. Right now the adult hawks are nest-building and mating and chasing out the little youngsters from their territories. Yesterday I saw one first-year hawk, but today I didn't see any (I did see a Cooper's hawk). The Cooper's hawk was literally chilling on the snow day. 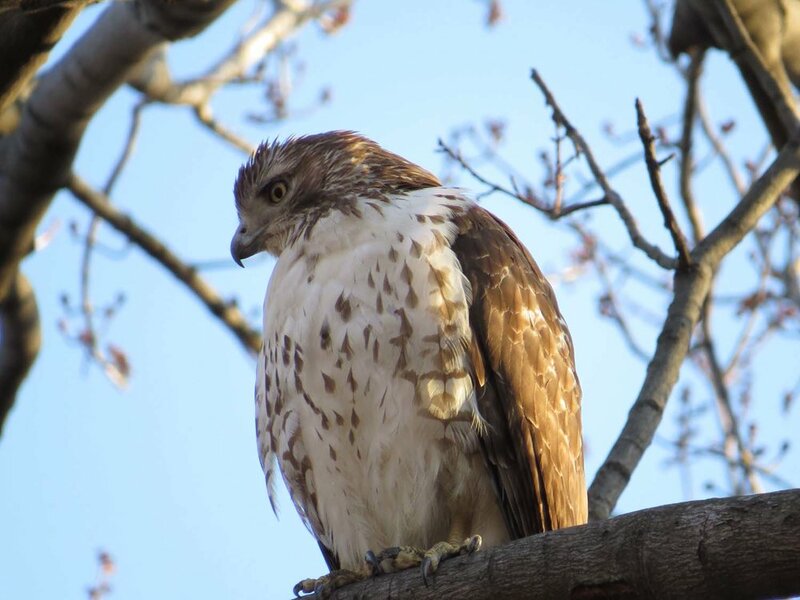 The photos below are of the young red-tailed hawks on Jan. 30 and 31.